There is no better way to dress up your home outdoors than with container gardens and patio pots filled with color and texture. Whether on your front steps, deck, by your pool, near an outdoor sitting areas, or right within your gardens, they add the special touch of decor needed as focal points. 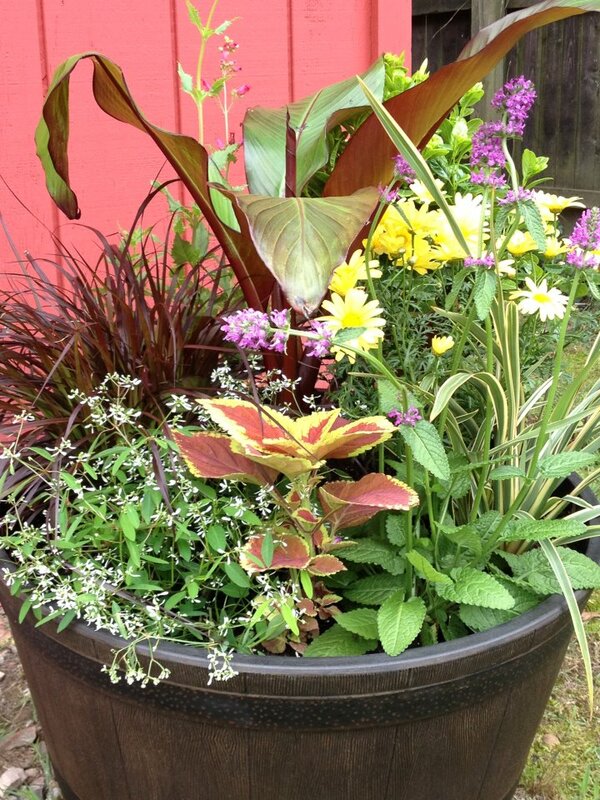 Container gardens are the accessories to your outdoor spaces. They add color, movement, and sounds. Yes, sounds. Hummingbirds will chirp as they swing by the flower’s rewards and birds will sometimes land on stalks of flowering plants. 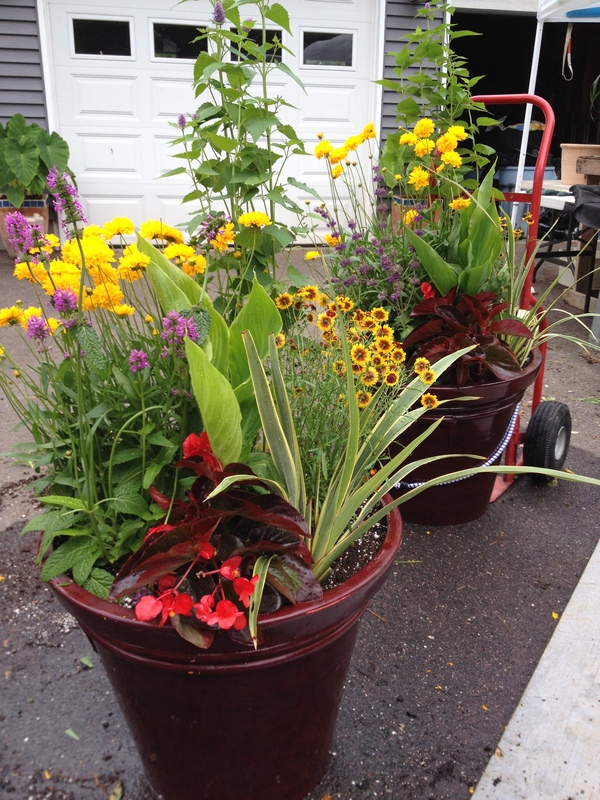 As part of Container Crazy CT’s business services, we design and deliver beautiful container gardens right to your home during the spring, summer and fall. To learn more, visit our new blog site established in March 2016 at http://www.ContainerGardensCT.com. My passion with plants started with putting together plant combinations in pots on my deck at our home. The deck, built by my husband and his buddies over 15 yeas ago, is a place I venture to every day to play with plants, rest, relax, and observe nature. Lots of entertaining occurs here too and to have the space surrounded and filled with plants makes the experience wonderful every season. Container Gardening is a form of decorating a new room at the home. It is a way to create and bring a place to life. It became my number one passion and full time hobby – and now profession. I find containers are a way to change your outdoor spaces each season, making it interesting and different. Think of containers like how you would change a space indoors, almost like how you would repaint a room, it makes everything brighter and more enjoyable. It makes us feel good when nature is part of our surroundings. When my family and friends come for a visit, they walk over to my deck first to see what is new this year or what I did differently with my container gardens and patio pots. This is such a compliment to me. Each year, a new theme is created based on inspiration that comes from many places – it could be a unique plant I spotted, something that came to mind while visiting a special garden or garden show, or something in nature which triggers an idea. Soon friends began to hire me to do container gardens at their homes because they wanted to repeat the feeling on their patio, by their entrances, or on their property. 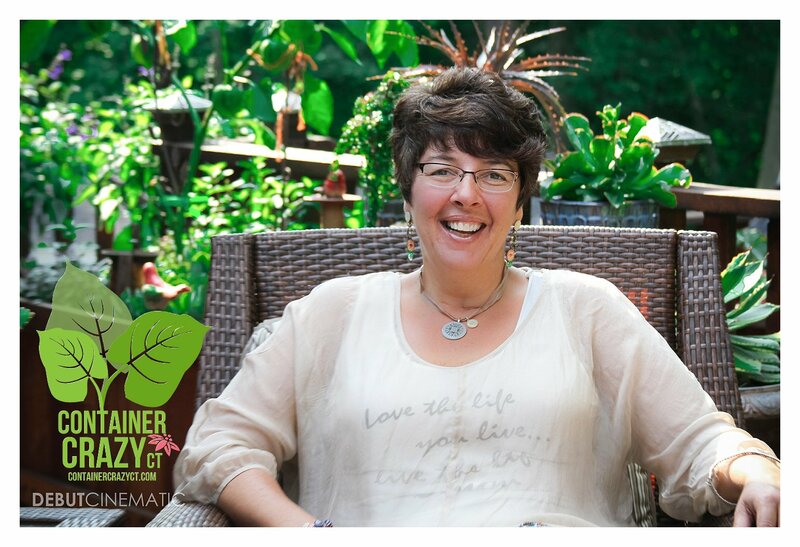 I love sharing what I’ve learned, the best and easiest plants to use in container gardens, searching plants that are a good value, and have showy and special features – From tropical to cottage like, Container Crazy CT will help you with the right look to suit your home’s outdoor decor style. I love offering container garden installations at homes. To me, it is an art form and I could do this all day long. And once you have hired me to do so, I’m always available to help you going forward if you wish to recreate the designs on your own. It starts with meeting with you to discuss your ideas and then we talk over my suggestions on everything from plant types to your favorite colors and culture. Some plants used may be stored for reuse each season for cost-effectiveness. Whatever your budget, let’s talk to discuss your needs and vision. On my website, www.cathytesta.com, are some examples of my work, and also on this blog, under CONTAINER GARDENS. Browse around on all the menus, sub-menus, and blog posts – There are many photos and stories about Container Crazy CT’s container gardening adventures and projects. I typically do not follow recipes as I create combinations – for me, it is about feeling the colors and textures and how they are working together. In fact, I tell attendees at my container gardening talks to not follow recipes. We go over how to select the right type of plants, what to look for, and think outside of the box. Just like when you have mastered a recipe in your kitchen, you learn not to read the directions anymore – and use the talents you have mastered. I don’t like to use the word pot, it is really a “container” we are speaking about. As part of Container Crazy CT’s installation services, we discuss the type of containers which work best for your situation. I will scout containers for you based on your preferences, color choices, and styles. There are many types of containers you may consider, and I help you with these decisions, and sometimes we use items at your home you may not have considered as a candidate for container gardening. Or perhaps you already have containers at your home – there may be some you never considered converting into a container garden. During our initial meeting, we can look over what may be doable as a container by reusing an item right from your home. After the season is over, I will advise you on how to best store any plants used that are hardy or reusable next year. This is an added benefit as a container garden installation client. Many people never experienced some of the tropical plants I use, and they learn how to keep them going for years to come. As a client, you can call me anytime with follow-up questions on how to care for your plants in containers during the season and after, when fall approaches. Documentation and instruction is provided with all plants installed. I won’t leave you guessing what to do the following year. Some folks just don’t like to get their hands dirty, can’t lift heavy items, want gardening at their finger tips or close by, or perhaps you just don’t have a lot of space, poor soil for gardening in the ground, or your currently limited to work on gardens due to health situations. Container Crazy CT is here to help you with these dilemmas. Container gardening is often the solution when you have difficulty with growing plants in a garden or don’t have the time to maintain a large garden. It is simple, fast, instant, and enjoyable from the beginning of spring all the way into fall – providing you have the right mix of plants in your containers. You plant once, and it is done for the season. Dianne, Suffield, CT: Each year I looked forward to visiting Cathy’s home to see her picture perfect and jaw dropping plants & containers she had grown always saying that one day I would have the same. 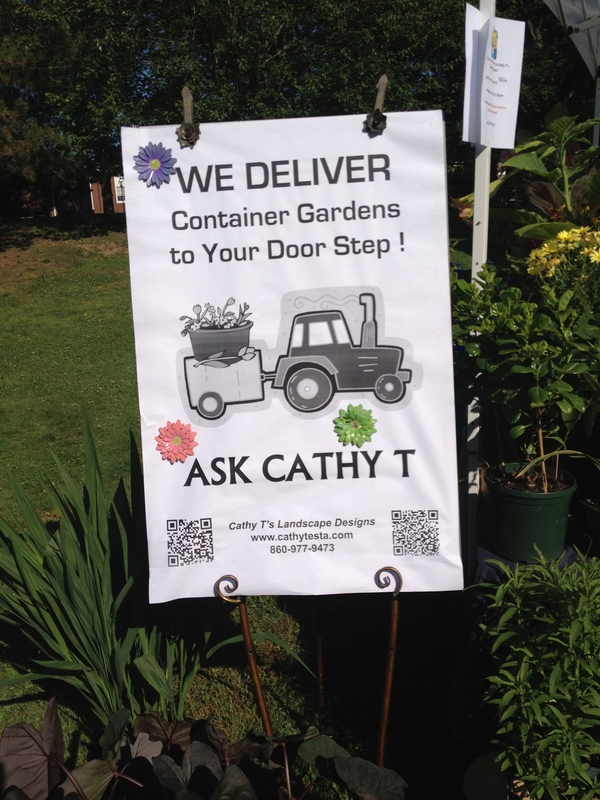 That day came last summer when I enlisted Cathy T’s Design to do my containers at my home. And all I can say is WOW ! Cathy certainly has an eye for each home’s personality and took into consideration the layout of my… property and was able to produce containers that displayed not only beautiful textures and arrangements of plants but also incorporated the colors I asked for and added her own special touches with glass beads and ornaments and antiques that I had on my property. Many of the quality plants that were purchased were perennials and that if I followed her instructions, I would be able to winter them in my basement to use again in the spring/summer. I followed her instructions and this summer was able to use what I had from last year and incorporate new plantings to my containers to achieve the look, texture, and colors that I wanted. I have been extremely happy with Cathy’s work, advice, choice of plants and color and what she did for me as a customer. My hopes for the future are for a hillside landscape planting from Cathy T’s. She is just so super fun to work with. She takes all the headaches away and is truly passionate about her work! Contact me any time to discuss your container gardening desires. I look forward to hearing from you this season.